The Condensate Pump Kit is a standalone self-contained fully automatic pump system for removing the condensate water by pumping it up hill if necessary. 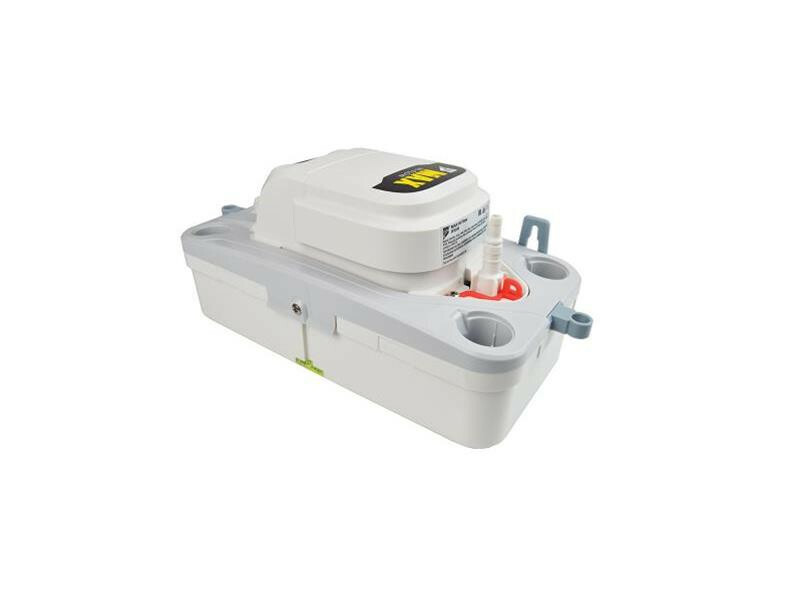 Powered from a standard 13A 3 pin socket, this mains powered pump unit simply plugs in and is placed on the floor near to your dehumidifier where it collects the water by gravity from your dehumidifier using the continuous drain hose (supplied separately if required). The water collects slowly into a 1.7 litre holding tank within the pump unit. When sufficient water has collected a float switch activates the pump and the collected water is pumped up and away through a 12mm diameter 4 metre long clear plastic pipe. Once the tank in the pump is empty the pump stops and waits for the tank to refil. Operation is fully automatic. The pump kit can pump water up to 5.0 metres above the unit. Supplied as a ready to go unit with 4 metres of outlet hose attached. Other lengths of pipe can be provided - please enquire.